Tough battle in the North East as Mackems try to stay afloat and United reaches for PL title contention. 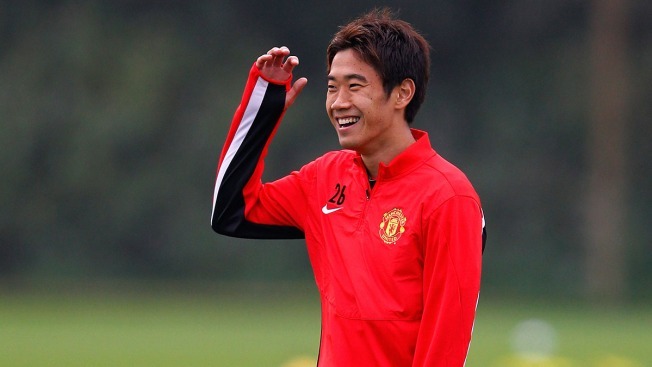 Shinji Kagawa of Manchester United smiles during a training session ahead of their Champions League Group A match against Shakhtar Donetsk at their Carrington Training Complex on October 01, 2013 in Manchester, England. On Saturday afternoon at the Stadium of Light, beleaguered Sunderland take on a Manchester United (12:30pm ET, watch live on NBCSN and online via NBC Sports Live Extra) also struggling at the start of the season. However the Black Cats’ situation seems much worse, with Sunderland rock bottom of the table with just one point from their opening six games. As for United, new manager David Moyes has had an acrimonious start to the campaign, with three defeats from their opening six games. Those losses came against Liverpool, Manchester City and most surprisingly, West Brom last weekend. Moyes will be looking for a reaction from his side, especially after letting a 1-0 lead slip late on against Shakhtar Donetsk in the Champions League on Wednesday. In the dugout for Sunderland, Kevin Ball will again be taking charge on an interim basis, as the Mackems board searches for their long-term replacement for Paolo Di Canio. Following the 3-1 defeat to Liverpool at home last Sunday, Sunderland could very quickly become cut off from the rest of the league at the bottom of the table. Favorites for the vacant managers job include Gus Poyet and Tony Pulis, amongst others. On the injury front, the home side have no fresh worries, with Steven Fletcher still recovering from his shoulder injury. As for Untied, Rio Ferdinand and Tom Cleverley could miss out but Wilfried Zaha, Anderson and Fabio could all return. Expect a tough battle up in the North East, with the Mackems scrapping for their lives and United eager to climb back into PL title contention. All signs lead to an away win, despite Manchester United’s recent poor form in the Premier League. Sunderland still haven’t got a manager and with Untied wounded and ready to launch themselves back towards the top of the Premier League, I would expect a reaction from them. But after a long trip to Donetsk in the Champions League on Wednesday and also letting in a late equalizer, this could be a good time to play United. Expect another stumbling display, but a Manchester United win.